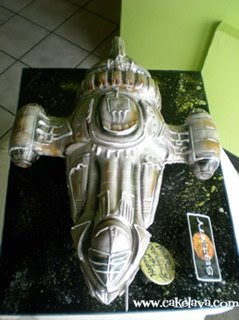 Back when this birthday cake order was placed and I was talking to our client Tiana about her desired design, she said she wanted Rick to sculpt a spaceship for her daughter's 14th birthday cake. I said "Sure, no problem" -- Rick can make a spaceship after all -- and asked her which spaceship she wanted. She told me it was a very specific spaceship and didn't know if it could be done, at which point I embraced the challenge and thought "try us." She proceeded to send us photos of a VERY ELABORATE spaceship that would be difficult enough I had to ask Rick if he was up to the task. He accepted the order. The spaceship she wanted was from a sci-fi TV show called "Firefly" which aired in 2002 and later became the movie "Serenity". I was told her daughter Shayna was absolutely obsessed with the show -- not just obsessed, but "absolutely obsessed" and would go crazy over this cake. Even better! 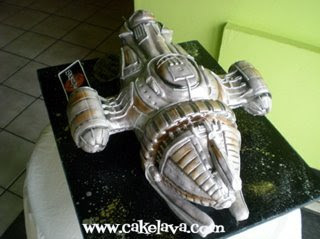 At this point I'd be lying if I said I was familiar with the show prior to receiving the cake order, and though Rick had heard of the show, neither of us could tell you anything about it, much less the nuances of the spaceship he would be sculpting. 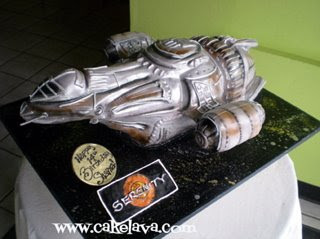 I felt like I was missing out -- what was this "Firefly/Serenity" show and since we're making a cake of the spaceship in the show, it's probably a good idea to see it at some point. Shortly before Rick made the cake for Shayna's 14th birthday party, which occurred over the weekend, I consulted blogger buddy, Mike, aka The Great White Snark who regularly showcases geeky cakes on his totally fantastic site, Great White Snark, and who was one of my previous interviewees. I told him we were making the cake and had he heard of "Firefly". Boy did I feel stupid. He wondered how I hadn't heard of Firefly, since apparently, everyone has heard of Firefly. He seemed quite excited to see the cake and was very happy with the result. and so was Shayna and her mother. Her mother brought her into our studio to pick up her surprise birthday cake and she was both excited and astonished. Shayna was afraid to cut into it but happy to share it with her friends attending who also loved the show. Happy Birthday Shayna. May it be one you'll never forget! 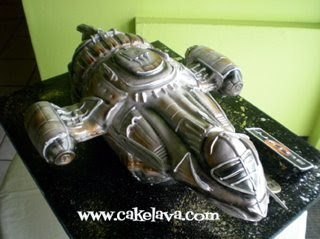 See Shayna's "Firefly/Serenity" spaceship cake on cakelava.com soon. 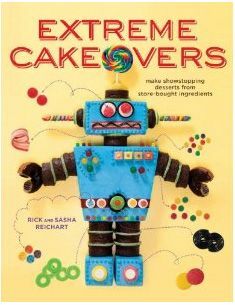 In the meantime check out our other geeky cakes. I love the movie and I LOVE this cake! 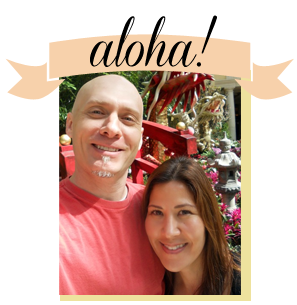 Drumroll, Please ... Heather & Jim Are Married! The Phenomenon we call "The Leslies"
Geeky Enough to be Geeky Cake of the Week! I Do ... and a Falcon too!